Twenty-one horse power, oversized therapeutic spa with 54 jets and deep tissue massage, two lounges, fountain and waterfalls, seats seven comfortably on back deck with private entries from bedroom or living room. Cabin built in the thirties with dark patina logs offset with light tongue and groove aspen. Big screen with DVD player in living room with nice stereo system w/three hundred disc changer and gas fireplace. New furniture with double recliners in the loveseat and hideabed with memory foam topper in the couch. Coffee table pulls up to provide dining area while you watch your favorite movies. Kitchen has any appliance you might want from deep fryer, toaster oven, bread maker, gourmet cookware, waffle maker, coffee grinder, popcorn popper, juicer, fajita kit, fondue pot, expresso machine, blender, coffee maker, salad shooter, slicer and electric wok. Kithen stocked with spices and dry goods for your culinary experience. Breakfast bar/bar with all the accessories for your favorite beverages. Bathroom has double headed shower with massage handles and washer dryer. Laundry soap, dryer sheets, shampoo, conditioner, body wash and lotion furnished. Bedroom has flat screen with DVD. One step from the outer bedroom door to the spa steps for those chilly morning sunrises. Fireplace for those romantic evenings. Super plush mattress set and pillows galore. Deck has dining area, lounging chairs, fountain, gas fireplace as well as spa and very nice five burner gas barbecue for entertaining or relaxing after your days of play in our corner of paradise. Walk across the highway and down a short trail for river and fishing access. Located centrally between three great snowmobile trailheads and eight miles from the Glacier National Park entrance, thirty miles to Big Mountain for fantastic skiing in the winter months. Lakes galore close in and thirty six mile long Hungry Horse Reservoir for your boating pleasure. Wilderness hiking and horseback trail rides also in the area. Snowmobile rentals are also available in area as well as RV, boats, wave runners, canoes, rafts, bicycles and more. Owner is a great host and will do his best to see to all your needs. Deck and backyard surrounded with pine trees and mountain views. Placemats and cloth napkins for that romantic dinner setting. (3) Sattelite Big sreen in living room with DVD, Flat screen in bedroom with DVD. Large wood deck with hottub, fireplace, and patio furniture, dining table, and barbecue with mountain views. Located next to a rustic bar/restaurant with a huge beer garden built in the 30's where you can mix with the local culture(they know the ins and outs of the area and the best fishin' holes). Great local classic rock and blues during the summer months on our indoor and outdoor stages. Great food and music with over 700 Cd's in there computerized music system. You can play hard all day rafting, hiking or what have you and then enjoy your favorite food and beverages in the safety of this all inclusive property. No drinking and driving to spoil your vacation time. Quaint, comfortable with everythng you need. The first thing to note about this property is it's location, which is next to a restaurant and bar on the Highway. It's a bit of an odd spot, but we stayed on a weekend and there was no issues with noise etc. The cabin is in excellent shape with a comfortable bed, full kitchen, huge hot tub, large private deck and yard and is very close to Glacier National Park. Overall an excellent value, and we would certainly consider staying here again. Very much enjoyed our days at the Cabin. Greg was very hospitable. We have stayed in cabins in this area before but must say that this one was appointed very well. The kitchen was well equipped to the point we cooked in 3 our of 4 nights. Nice Grill outdoors, the hot tub was fantastic after a day of hiking. I would return to the property. Relative to location/location, it is so close to East Glacier, which is such a huge bonus. Second location is that it is very close to the Packers Roost which is a very popular spot and when we checked in with a lot of luggage we had to haul it pretty far. That is the only caveat to booking here. It is very close to the bar, but also VERY close to Glacier National Park. Basic accommodations for a bachelor, not a family. We enjoyed a couple days at this cabin, despite a few minor issues. The cabin is located very close to the entrance of Glacier National Park (about 10mins away from West Glacier) but it is right on a busy road and literally, right next to a bar with a rough crowd! The cabin shares a fence with the bar, that is how close they are! While the bar wasn't too rowdy the nights we were there, it did make me uncomfortable to be out on the deck or in the hot tub. Anyone from the bar could stumble over to the cabin at any point. Our car was often blocked in by people parking for the bar. The cabin itself provides the basic amenities - full kitchen, decent bathroom and laundry and Netflix on the smart TVs. If you are a single man exploring the park, it would be ideal, as it is the ultimate bachelor pad. For a family, though, it was not comfortable. My 13 yr old son and I stayed and I did not feel at ease in the cabin. In fact, he slept in the room with me because there weren't any curtains or blinds in the living room and he was worried someone from the bar would see him in bed. There is one small AC unit in the kitchen window that cools the living room nicely but leaves the bedroom very warm. The sheets and towels were freshly laundered, but I would not call them clean with stains and crusty bits that did not come off in the wash. Remotes were sticky and silverware and glasses needed washed before we used them. The owner stays in his RV in the driveway of the cabin which is slightly uncomfortable - especially for a young girl and her son. The deck and hot tub would be a great space if they didn't share a wall with the bar crowd. It wasn't too peaceful to soak in the hot tub with the neighbors playing what sounded like horseshoes 5 feet away. The hot tub is ok but the cover is too heavy for one adult to handle on their own as it is made out of 2' by 4' wood! We could see that chemicals had just been dumped in the hot tub, but that did not help the pine needles and bugs that were floating in it. Overall, I gave this cabin a rating of 1 since it is not as it is described: Luxurious! I think the owner would do better to describe it as rustic, basic and live-able provisions for someone hiking or coming out of the park after a few days of camping. I would also recommend tidying up your book collection - books on how to stay sober, fight depression and battle demons in your mind do not welcome visitors. Funny the contrast in the last two reviews. One loved it and the next one didn't, but I will address her concerns. It says right on the sight that it is next to a bar and restaurant. As far as the bar being rough or rowdy(kind of funny she said it was, but not while she was there) that is preposterous. We sell more food than alcohol and have families eating with their kids all day everyday. The fence between the cabin and the bar is an eight foot double sided privacy fence that you can neither see through or climb over. There are blinds on all the windows except the oversized sliding door out to the deck. It faces a six foot privacy fence out to the back property which is empty behind the cabin and posted no trespassing. No bar/ restaurant customers are allowed or ever go back there, or near the front of the cabin for that matter. The horseshoe pit is in the far corner of the beer garden from the cabin, so the closest pit is about seventy or eighty feet from the deck feet from the deck. If it were five feet it would be in the back yard of the cabin. I know my professional cleaning service wouldn't put sheets on the bed with food or whatever stuck on them. As far as the spa goes yes I treat it before each guest and a spa surrounded by big pines all around is bound to catch a few pine needles when it is open and being used. There are no bugs in it, they are buds off the pine trees that blow in or fall in when it is in use. Once again spa is vacuumed before each guest also. There is a high temp dish washer that all dishes are done in, but I imagine she might be talking about water spots, as the artesian well that feeds the cabin has very hard water. I don't want to put in a softener in and ruin the taste of this pure artesian spring water. Sorry AA books offended her, but it is my library and a lot of guests enjoy the library. She forgot to mention that a large part of the library is all Christian sourced. My motorhome is parked next to the bar in front when it is there, but certainly not in the cabin driveway. Hope I addressed any concerns anyone might have. If you read the review before this it actually addresses the location, but in a positive light despite the highway and bar next door. Have had lots of honeymooners that adore the cabin, so not sure why she called it the perfect bachelor bad. Safe and happy travels to you and yours wherever you stay. Don't let first impressions fool you! Even though this cabin is located on a busy road and situated next to a bustling bar, it still provides a relaxing oasis near Glacier National Park. Despite all of the activity taking place around us, life in the cabin was peaceful and quiet. Just as importantly, the cabin is roomy and well-equipped with a dishwasher, washer/dryer, grill, hot tub, and multiple televisions. We absolutely loved the spacious back deck and yard, where we grilled and hung out with our pups. Greg, the owner, was incredibly accommodating and checked in regularly to make sure we were enjoying our stay. Located approximately 10-15 minutes away from Glacier National Park, this cabin was the perfect "home base" for our vacation. There are so many options for outdoor activities nearby that we were never bored. Another bonus is that it's located directly on the paved bike path, so it's fully feasible to road bike all the way to the park and then onto its bike paths. 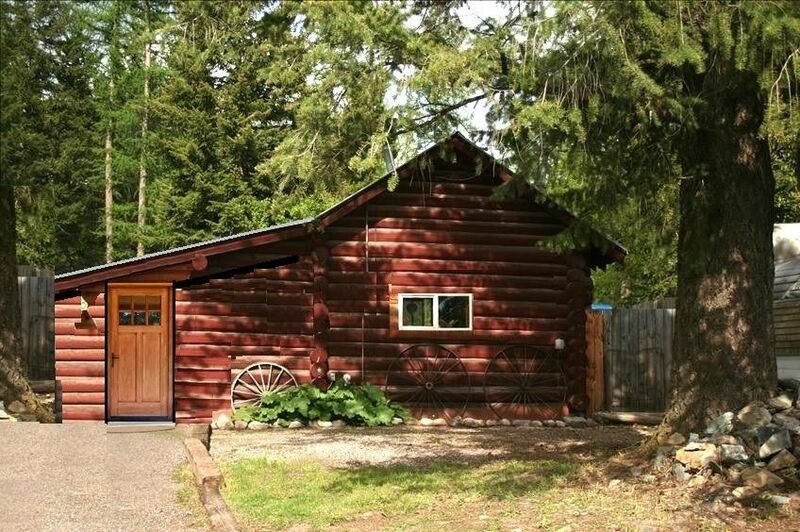 This cabin really is situated in an ideal location for those who want a bit of privacy while remaining near the park. We thoroughly enjoyed our stay at this log cabin and would happily stay here again. The cabin is super cute inside. It was a great location for a home base to visit West Glacier, Whitefish and Hungry Horse. The back yard made it really nice for traveling with our dog. The Packer Roost next door has really good food. We loved our stay. Greg was once again a great host and we will return again. Waterslides, maze, bumper boats, go-cart track, mini golf, 18 hole golf course, Glacier Park helicopter tours, bear park, museums, whitewater rafting, 50 mile long reservoir and dam as well as lakes all over the area for your boating, fishing, skiing and sightseeing pleasure, as well as Glacier National Park within ten minutes of your front door with miles of hiking trails and some of the most gorgeous scenery to be found.